In ancient mythology, Apollo was the god of, well, almost everything: music, poetry, medicine, art, knowledge, sun and light, and more. In a more contemporary sense, it speaks to NASA's lunar missions. 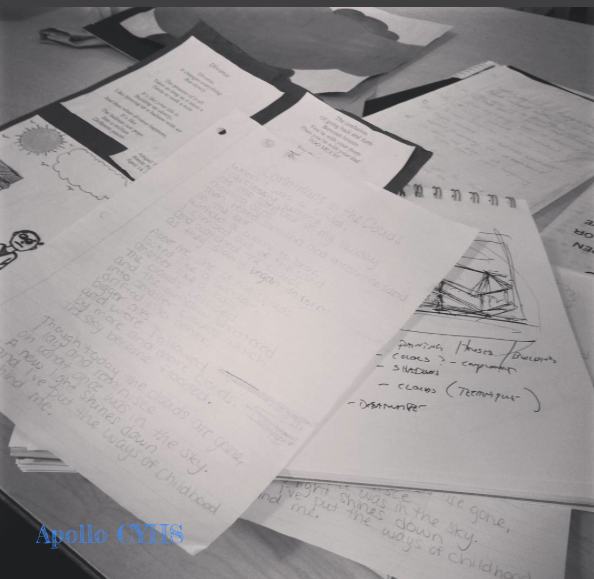 We chose the name "Apollo" to convey the multifaceted elements of this course. 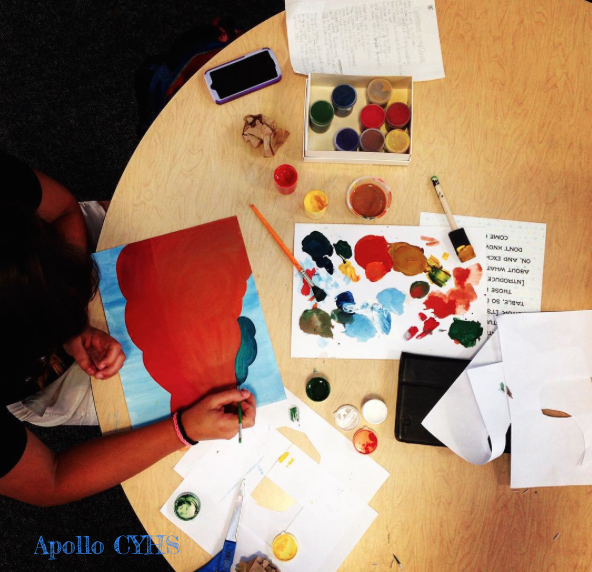 At its core, Apollo infuses language arts, social studies, and art. But there's also a lot more involved, including higher order thinking skills, independent learning and accountability, along with other advantages often not found in a traditional classroom. Imagine this: you walk into school on a Monday morning and report to your first class, Apollo. During a "family meeting" with your three learning coaches and classmates, you discuss the week's plan and sign up for the lessons you'd like to attend Monday through Friday. The lessons you choose are based on your current projects, independent and group. After you sign up for the lessons, your work day begins. You may work in the library, the student work areas, classrooms, etc. when you're not attending a lesson. Of course, you may reach out to your three learning coaches at any time for one-on-one support, and, at designated times, you will meet with them to discuss your progress. Establishing Roots is about the roots of America and Americans. This unit focuses on the roots of our American identity. From exploration to Puritan characteristics to the development of the American voice in literature to the plight of the immigrant, all start to define what this new society is going to become. Narratives, poetry, and short stories will all be explored to understand the root of America. ​American Philosophical Voice focuses on the philosophies that influence the American voice or are influenced by American ideals. These voices, often in the form of writing, span across centuries. Though we are all Americans, our voices, along with our philosophies, vary in this melting pot in which we live. Literary works in genres of Transcendentalism, Utopia/Dystopia, and Realism will be focused upon. Justice for All is self-explanatory, and the unit will focus on a variety of individuals and groups who seek and deserve justice. From argumentative writing to speeches to rhetoric across the land, words are powerful weapons that have been used to deliver justice to millions of Americans (and even those abroad). The American Dream: Does it exist or is it an illusion? Is there a prototype or does it vary for each American? Also, how has the dream transformed over the centuries--or hasn't it? Is it attainable for all Americans or just a select few? Does it extend beyond our borders or is it only ours? In twelfth grade, Apollo students are encouraged to reach beyond the borders of America, delving into four regions around the world. Projects will likely focus on Middle Eastern, Eastern, European, and African virtues. Exceptions can be made if another area of focus is proposed and promising. Skills are the core of Apollo. A combination of Marzano's Essential Instructional Strategies and the CollegeBoard's Thinking Skills, Apollo addresses 4 thinking skills and 2 soft skills every learner needs to demonstrate in each of the content areas. 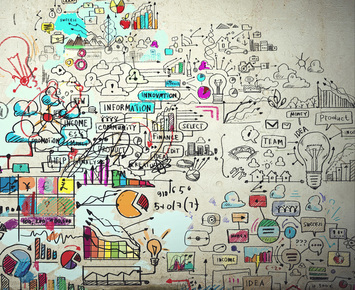 These skills also serve as the core to the 4 individual projects students will complete. 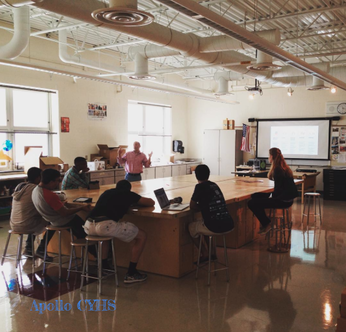 Students will align three thinking skills to each of the projects as well as two soft skills. The soft skills round out the learning experience by requiring students to demonstrate their ability to care for others, communicate effectively, or make calculated decisions. Despite the large degree of student autonomy, this course is grounded in Common Core and National Art standards. 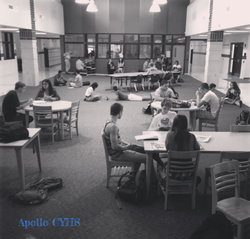 Approaching learning through different means does not excuse Apollo students from meeting the same expectations as traditional students. On the other hand, it adds a more genuine, authentic element to their learning. Students are asked to identify the standards they'll attack in each project. Through mini lessons and one-on-one sessions, the facilitators will assist students in linking their projects to these standards (and skills).